What a day! I've had child duty by myself for the last fifteen waking hours. This evening I needed to send over a meal for a family whose loved one is hovering near death. Then, after I put all the ingredients away, get a call that my husband needs a second pie as a special thank-you tomorrow. Grrrr! What about Gladware for sending food out? My step-mom gave me some and it works well for us, except for casseroles or pies. Huh. Maybe it doesn't work so well....lol. What kind of pans are those? They look heavy duty. Well, that's what I thought, until I went to buy some at Kroger. Wow! The big containers are expensive, more than I want to pay for disposable goods, anyway. 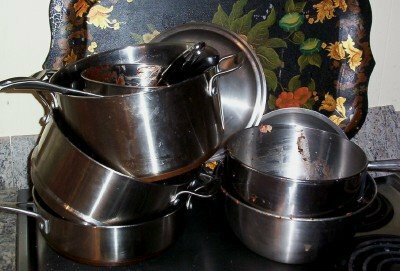 The pans are a storebrand set from Dillard's, which went on 75% clearance due to a design change. I was ready to move away from nonstick linings. Luckily, I had a gift certificate. Keep an eye out for coupons in the SUnday papers. This past week there were coupons for the collapsable rubbermaids. The rubbermaid site also has a printable coupon for disp. RM containers. On another note, try Dollar Tree and Dollar General. Both have cheap containers, and DG accepts manufacturer's coupons. I use the aluminum pans at DG to send food in. Though I do remember as a child when we got meals, we had to get all the containers back to their families. So. Worst comes to worst, put your name on the dish and use what you have. The Gladwares can be washed in the dishwasher, so the lucky recipient of your cooking gets the added benefit of a free storage container. Of course, it's not as much fun as something like a Pyrex pie dish they can use forever! I second the idea of trying Dollar Tree for Gladware-type and foil containers. A thought -- some grocery containers work well (like the ones veggies, or bakery goods are packaged in). I line small cardboard boxes with aluminum foil. It's worked out pretty well. I struggle with containers for give aways too.